China's best-known human rights prisoner, Liu Xiaobo, died Thursday at age 61 following a high-profile battle with liver cancer that made his death as controversial as his life. Liu’s final days were marked by a public dispute over the quality of his care and Beijing's refusal of a family request that he be transferred for treatment to the United States or Germany. He is the first Nobel laureate to die in state custody since Carl von Ossietzky, who died of tuberculosis under the watch of Nazi secret police in Berlin, Germany, in 1938. Tributes to Liu quickly poured in from Chinese intellectuals and human rights advocates, who described the former college lecturer as a moderate liberal who advocated peaceful resistance to Chinese authorities. “He was a man of humanity and an idealist. He’s by no means a politician. Judging from his writings and speech, what he had illustrated is more of a social idealism of humanities,” said Zhang Lifan, a prominent Chinese historian. Liu, whose name means “he who knows the waves,” was born into an intellectual family in 1955 in China’s northeastern province of Jilin. He received his doctorate degree in Chinese literature from Beijing Normal University in 1988. His reputation as an outspoken dissident had deep roots. In his brief, government-sanctioned role as a popular writer and academic, he was known for his criticism of traditional Chinese culture and for urging his fellow literati to exhibit more individualism. His sharp critiques created a sensation within literary and intellectual circles and won him opportunities to travel abroad as a visiting scholar. His promising career took a drastic turn in the spring of 1989 when he cut short a visiting scholarship at Columbia University in New York City and returned home to join student-led pro-democracy protests in Tiananmen Square. “During the June 4th protests, he rushed back to Beijing from the U.S. to take part in the movement without any hesitation. That showed his earnest hope in the society’s transformation and the country’s democratization,” said Hu Jia, a Chinese rights activist and friend of Liu and his family. Hu credited Liu with saving many lives by encouraging hundreds of students to leave the square rather than confront the Chinese troops who moved into the square with tanks in the early hours of June 4. Despite that action, and a controversial television appearance in which he cast doubt on reports of a massacre in the square, Liu was labeled a “black hand” and jailed for his role in the protests. Upon his release in early 1991, he continued to call for political reforms and was sentenced to three years in a labor camp from 1996 to 1999. Liu kept on pursuing his reform goals after his release, making him a constant target for state surveillance. In 2008, Liu and other dissidents and intellectuals issued a document known as Charter 08, modeled partly on Charter 77, which Czech dissidents, including Vaclav Havel, drafted in 1977. The political manifesto, which was endorsed by more than 10,000 intellectuals, calls for an end to China's one-party system and establishment of a new republic comprising a “federation” of regions and political communities, with genuine participation from the public. Even while he was enjoying relative freedom out of jail, thoughts of when he, and others like him, might be locked up again were never far from his mind. “For those of us in the opposition movement under dictatorships, part of our job is confronting police, and spending time in prison. So, a dissident not only needs to learn how to oppose oppression, but also how to face the crackdowns, and time in prison,” Liu told reporters from Hong Kong. Liu learned of the honor from his wife during one of the limited prison visits she was permitted. He replied that the prize should be dedicated to those who died in the 1989 mass protests and subsequent crackdown. “Hatred can corrupt one’s conscience and intelligence, enemy mentality could poison a nation’s spirit,” Liu said in the speech, which was read in his absence at the Nobel Prize ceremony. 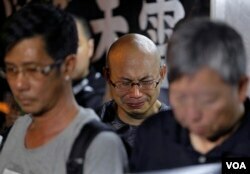 Liu’s remarks confounded many advocates for democracy and freedom for China. Critics pointed to the harsh treatment, including severe torture, of other activists to show the Chinese prison system is far less “humane” than Liu described it. Some suggested the authorities purposely showed leniency toward Liu so that he would make public statements in their support. Liu was still three years from completing his prison term when he died. The German and American doctors who were allowed to see him during his last days reported that Liu, days before his death, had clearly communicated his wish to leave China for treatment elsewhere. However, Chinese authorities maintained that he was too sick to be moved. 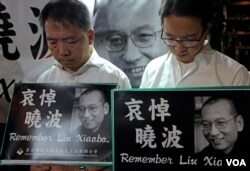 Liu Xiaobo is survived by a son, and his wife of 21 years, Liu Xia, a staunch supporter of her husband who is reported to have said that she was determined to marry the "enemy of the state." Reflecting on their lives in a poem, she said, "I like to draw trees; why? I like the image of it standing. A life spent standing must be tiresome, you say; I answer, yes, but still I must." Please leave a comment here, and visit us on Facebook, Twitter, Instagram and LinkedIn, thank you.